Gibraltar once was the subject of ridicule among the Apex Legends characters roster, thanks to his enormous hitbox, and despite his excellent and versatile array of abilities. But with the release of v1.1.1, Gibraltar has received a substantial buff, and we’re now likely to see a lot more of him in King’s Canyon. Our Apex Legends Gibraltar guide will walk you through each of Gibraltar’s abilities in turn, with top tips and tricks on how to use each effectively. 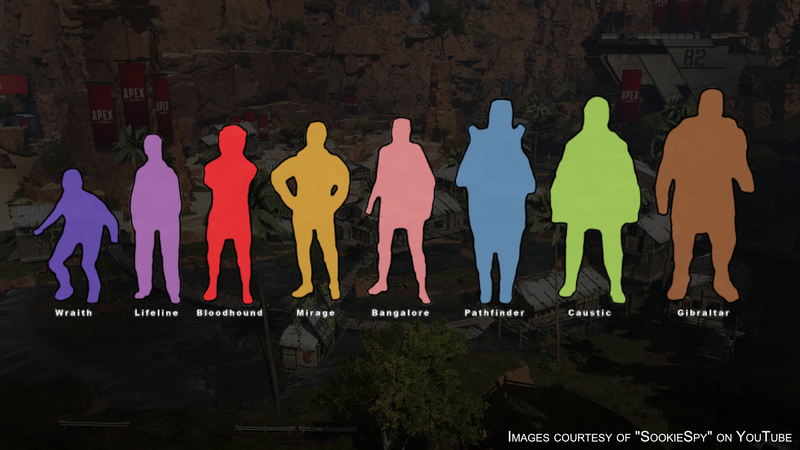 For full details and opinions on all of the characters together, take a look at our Apex Legends characters guide for everything you need. Alternatively, if you’re looking for a focused guide like this one but on a different Legend, then simply take a look at the table below and click on a link to be taken to the hero of your choice. Each of these pages is fully up to date with the latest tips for the start of Season 1 and the 1.1.1 patch notes (which you can read in full detail over on our Apex Legends update page). There’s a lot to cover with Gibraltar (no, that wasn’t a comment on his size), and a lot to learn if you want to truly master the Shielded Fortress of King’s Canyon. Click on any of the below links to skip straight to the section of your choice. Let’s get this out of the way first: yes, Gibraltar is big. The biggest, in fact. And it’s a substantial downside to playing as him in Apex Legends – or at least, it used to be (more on this in a moment). But even pre-1.1.1, once you got past this, if you took the time to learn and master his abilities then he’d prove his worth many times over. Gibraltar’s focus is in protection and defence, though he can also initiate and push with a great deal of success. His Passive provides him with a great deal of personal tanking potential, while his Tactical Dome of Protection, if used correctly, can completely change the course of a fight. His Ultimate meanwhile, much like Bangalore’s, can be used both defensively and offensively – particularly offensively, though we’ll get to that in a moment. The trick is to make use of your abilities in order to have a marked effect on encounters with enemies, because in a straight up no-abilities fight, Gibraltar will always be at a disadvantage with his large hitbox. Learn the moments where your Tactical and Ultimate would benefit your team (particularly with the Dome, there are specific uses that can really help you on your way to become the last team standing) and stay on the move as much as possible. Despite his slow-feeling movement animation, Gibraltar has the same movement speed as any other character, so you won’t have any trouble keeping up with your teammates. Season 1 brought with it a host of balance changes to the abilities and hitboxes of various Legends. Gibraltar’s hitbox was reduced to better fit his (still quite enormous) character model, and his Ultimate, Defensive Bombardment, was fixed so that the stun effect would affect teammates just like Bangalore’s Ultimate. But that’s so last month. The 1.1.1 patch notes released on 16 April elevated Gibraltar to unprecedented heights with two massive buffs. The first is to his Passive Gun Shield, which now absorbs a full 75 Health before disappearing instead of just 50. The second, which everyone is very excited about, is the addition of a new “Fortified” Passive to sit alongside his existing Gun Shield Passive, which reduces all incoming damage by 10%. Both changes were clearly stated by Respawn to compensate for his larger hitbox and increase his overall viability as we continue into Season 1, and so far it looks as though it’s done the trick for both Gibraltar and Caustic (who also received the “Fortified” damage reduction as the other Legend with the largest hitbox). Read all about these and previous patch notes by heading over to our Apex Legends update guide. But thanks to the 1.1.1 update, Gibraltar and Caustic are able to enjoy a flat 10% damage reduction to compensate for the increased number of bullets that hit their bulky bodies. And with Gibraltar’s combination of the Fortified and Gun Shield Passives (not to mention his Dome of Protection Tactical ability), if you play him well you’ll easily be one of the hardest characters to down in Apex Legends. Gibraltar’s abilities, as discussed, generally revolve around protection, zoning, and changing the pace of a fight – though they all use very differing methods to accomplish this. Let’s take a look at each ability in turn, starting with his Passives. Gun Shield 75 HP Aiming down sights deploys a gun shield that blocks incoming fire. Fortified N/A Reduces incoming damage by 10%. Fortified is here! It was talked about for a long time up to this point as a possible method of making big chunky Gibraltar and Caustic more viable, and Respawn have seen fit to add the flat 10% damage reduction with the 1.1.1 patch notes. I won’t spend time talking about it, because there’s not much to talk about here. But it’s good. Gibraltar and Caustic really do feel more tanky than the other characters now, and it’s a much-needed change. Gibraltar’s original Passive, Gun Shield, doesn’t require much mastery at all, and without it there would be no saving him when under fire. With this Passive, every time you aim down sights as Gibraltar, after a brief delay a personal shield will flick on in front of you, covering a large section of your body from the front. You can, of course, fire through this shield, but enemies will have to inflict 75 damage to destroy the shield before they can start to damage your regular Shields and Health. What’s more, the Shield will block all damage from the last shot that breaks it; for example, a Kraber shot will deal 125 damage, but Gibraltar’s Shield will block the entirety of that damage before breaking, even though it only has 75 HP. If you’ve taken a look in the keybind settings for Apex Legends, you may also have noticed that there is a specific keybind for toggling Gibraltar’s Gun Shield on and off. Uses for this are few and far between, but it’s true that the brightly glowing Gun Shield does stick out like a sore thumb even from a distance, so at times you may want to turn it off when sniping or initiating, before turning it back on once your presence is already noticed by the enemy. There is a slight delay between aiming down sights and the Gun Shield appearing, so sometimes it’s best to ADS ahead of time to avoid being let down by this delay. There is a cooldown to the Gun Shield once it has been broken, but this cooldown can be reduced using Shield Cells, Shield Batteries and Phoenix Kits. For more info on all the different types of healing items in the game, check out our Apex Legends healing items guide. All excess damage delivered by the shot that breaks the Shield will also be absorbed (see the Kraber example above). The Gun Shield can be spotted easily by enemies, so you may sometimes want to toggle it off when initiating. Just remember to toggle it back on once the fight has properly begun. The animation of holding your shield out in front of you as you ADS does obscure a section of the screen below your gun, so make sure your enemy is clearly in your sights while aiming as Gibraltar. Gun Shield will only activate while aiming down sights, so it’s best to equip Gibraltar with weapons that benefit from ADS rather than hip-firing: ARs and SMGs rather than Shotguns. Protection 15s 20s after Dome expires Throw down a dome-shield that blocks attacks for 15 seconds. Gibraltar’s Dome of Protection is one of the surest and most immediate ways to alter the makeup of a team fight. This shield will deflect and absorb all gunfire and ability-related damage, while allowing any player (friend or foe) to pass through its barrier. Using this Tactical ability was prompt Gibraltar to throw down a small circular generator onto the floor in front of him, around which the Dome will immediately appear. This is an excellent defensive ability that can be used to great effect while healing, reviving, using a Respawn Beacon, and numerous other circumstances; however, it can also be misused, with spectacular results, if you don’t coordinate with your teammates and accidentally end up capturing the throwables for Bangalore‘s or Caustic‘s Ultimates. Regardless, it’s a strong and dependable form of protection. However, you do need to be aware that it is one of the most visible phenomena in Apex Legends, and enemies will be able to see the Dome from a very long distance away. If used during an encounter, it’s imperative that your team maintains control of the Dome, rather than allowing the enemy to take over it. Having said that, you should aim not to occupy the centre of the Dome, but to dance in and out of its edges, much like you would with Bangalore’s Smokes. This way, you have the advantage of its protection, but you can quickly jump through in order to deal quick damage before dodging back again. If you’re caught somewhere with no cover, quick use of your Dome can save your – and your teammates’ – lives. Dome of Protection is an excellent thing to use right on top of a Respawn Beacon before you use it to revive your fallen teammates. Respawning teammates at a Beacon attracts a lot of attention regardless, so it’s not such a big deal to throw down a Dome for some added protection while the progress bar holds you still. You can block the projectiles of Bangalore’s and Caustic’s abilities, so be careful when you use it. Use the Dome to avoid damage from your (or another Gibraltar’s) Ultimate, as well as Bangalore’s Rolling Thunder Ultimate. A good combo when you’re threatened and require time to heal or revive is to throw down first your Ultimate and then your Dome on yourself. You can place your Dome generator atop Lifeline’s Drone, and then push the Drone along in order to move your Shield. Bear in mind that the Dome is a half-sphere, not a full sphere. It will not descend into the ground or any further than the surface upon which the generator lands. Don’t be afraid to place down a Dome in the middle of a mid-range fight simply to heal up or quickly revive a teammate. Fight around the edges of the Dome, just as you would with Bangalore’s Smoke. Bombardment 4m 30s Call in a concentrated mortar strike on a marked position. On the face of it, Gibraltar’s Ultimate, Defensive Bombardment, looks very similar to Bangalore’s Rolling Thunder ability. and it is, really. Both require you to lob a throwable at a specific area, after which missiles will rain down around that point before exploding, dealing damage to and stunning enemies (or yourself if you’re caught in the blast). The difference is that, while Gibraltar’s missiles deal just as much damage as Bangalore’s, Gibraltar’s Defensive Bombardment operates in a smaller circular area, turning it into a more concentrated damage-dealing Ultimate. Moreover, the delay between throwing the marker and the missiles exploding appears shorter for Gibraltar than for Bangalore. It can be tricky to know when is the right time to use Defensive Bombardment; it doesn’t have the same utility as Bangalore’s Ultimate because it lacks the size to operate as a truly effective zoning tool. However, it can be used to great effect when initiating or if you need to flush out an enemy team sitting behind a rock or some other cover. Even if they do escape in time, it often provides your team with enough of a distraction to move to a better position or to make a push towards the enemy to end the fight. You can also use Gibraltar’s Ultimate in conjunction with his Tactical on yourself for some momentary respite if you need to heal or revive a teammate. Anyone caught be these missile blasts is stunned, whether friend or foe – and while your teammates don’t take damage from the missiles, you will, so be careful when placing it near you. A good combo when you’re threatened and require time to heal or revive is to throw down first your Ultimate and then your Dome on yourself. You can use Defensive Bombardment offensively to great effect, either to initiate or to flush out enemies holed up in a specific location. If even one enemy is downed by your Ultimate, it has done its job admirably. In a more limited way, you can use Gibraltar’s Ultimate as a zoning tool much like with Bangalore’s Ultimate, either by throwing it between you and the enemy team or on yourselves, in order to give you the freedom and time to reposition or flank the enemy. Finally, let’s finish up with some more general tips and tricks on winning Apex Legends matches as Gibraltar. Your team needs you. Gibraltar is not a good solo Legend. His abilities are all meant for use to further and elevate your team as a whole. Look for any opportunity to help out your team with a Dome, or simply by moving in front of them to soak up some damage with your Gun Shield/Fortified Passives. Communicate your ability usage. Improper use of your Dome or Defensive Bombardment can ruin your team’s chances of victory, which I think is another reason why many people are keen to avoid learning him. The key is just to communicate your intentions with your team whenever possible, to make sure you don’t screw them over at all. Work to manipulate the overall fight to your advantage. Gibraltar is a master manipulator of the fight. His Tactical and Ultimate abilities both serve similar purposes, despite one relating to damage and the other relating to protection. Learn proper placement and usage of these abilities to force enemies along the paths you desire, or to halt their own plans in their tracks. And that’s pretty much everything we’ve got on Gibraltar for now. If you were a Gibraltar naysayer before, hopefully you’ve gained some more understanding of how this beefy tank of a Legend can be used to great effect in the right hands. Now it’s time to get back out there and start soaking up some bullets for your team!